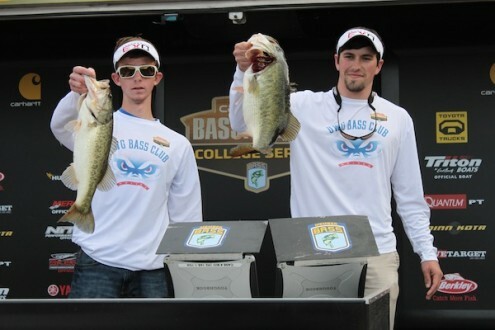 The UWG Bass Club made a big splash in the collegiate bass fishing scene earlier this year. The club qualified for the Bassmaster National Championship after they finished tenth out of 120 teams in the Carhartt College Series Southern Regional Tournament that took place in Tavares, Florida. UWG Bass Club anglers Kenny Johnson and Brandon Larry finished with a combined weight of 27 pounds in the club’s first ever competition. The tournament took place on January 4-5 at the Harris Chain of Lakes near Orlando, Florida. Things looked bleak for the team during their three practice days before the tournament. “The first day we caught one fish. The second day we didn’t even get a bite. Then on the third day we found some promising areas,” said Johnson, who is president of the club. After the first day of competition, the team weighed in four fish at a weight of eight pounds, nine ounces. “We were sitting in 37th place after the first day so we knew we had to go down there the second day and get it done,” said Johnson. The team finished the second day of competition with a weight of 18 pounds, seven ounces and jumped to tenth place in the tournament standings. They were competing against colleges from all classifications, including NCAA Division I schools who are often supplied with very high quality tackle, boats and equipment from their schools. “At the bigger schools, when you walk on the team, you get a $70,000 rig,” said club member Justin Walton. The UWG Bass Club are given some small sponsorships, but they must use their own tackle and boats since it is not an official athletic program at UWG. Many of the tournaments that the club will compete in pay out monetary awards which will go into the UWG Bass Club and help them acquire tackle and equipment. “We experienced engine trouble the night before the tournament started,” said Johnson. “We were going around the lake at 40 miles per hour while everybody else was running 70 miles per hour.” Having a boat that is able to travel at high speeds is a significant advantage in competitive bass fishing. The tournament will air on ESPN2 later next month, while the Bassmaster National Championship will take place on the Chatuge Reservoir at a date that is to be announced, will be aired live on ESPN. The Bass Club is one of the newest additions to the growing number of Club Sports programs at UWG. The club began in December and now has eight members. “It’s not hard to join the club at all,” said Johnson. Students who wish to join the UWG Bass Club can contact Johnson via email at kennyjohnson519@yahoo.com. Hello, its nice post about media print, we all understand media is a impressive source of information.